A quick evening of sewing and with the help of Rae's detailed Peekaboo Bonnet pattern and I had this adorable little cap. Scrumptious!! 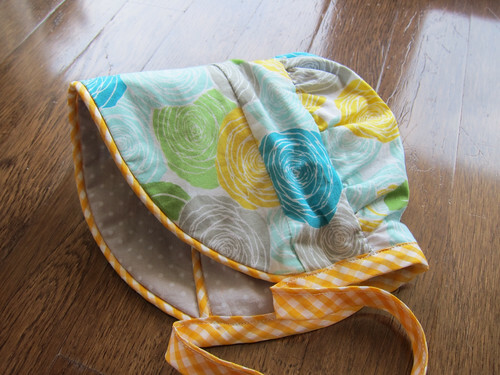 I love the lack of raw edges and the fact that it is reversible, which doubles its utility. Rae's pattern was well written and easy to follow. I did find some of the seams a little awkward due to the bonnet's small size and round shape but i suspect that that was more of an Amanda vs. 3D sewing issue than a real issue. Having made one of these, I am confident that the next one will be even easier. 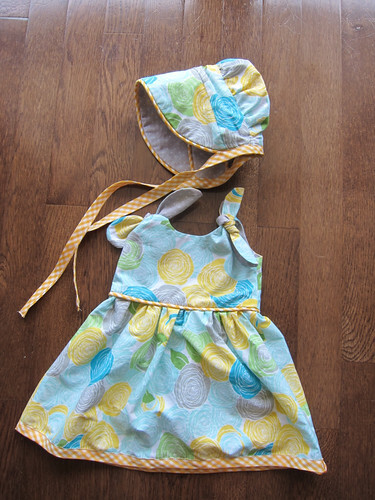 As with the matching dress, I used fabric, binding and cording that I purchased at Fabricland. The only change I will make to the next one will be to interface the patterned band before attaching it. I found that with the way my bonnet came together it tends to collapse/wrinkle. 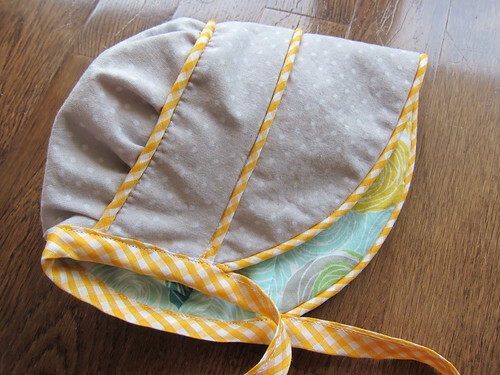 Now my friend's sweet little baby will have a new outfit to add to her summer wardrobe! Thanks to all who entered our giveaway. Our winner will be announced in the next couple of days. Linking up to Finish Up Friday over at Crazy Mom Quilts. This is totally adorable - I'm sure your friend will be thrilled with it! Fantastic fabric choices - it's so sweet and girly without being overly fussy. Oh my gosh, makes me want to have a little girl! !